Welcome to the Stampin' Addicts Summer Mini Blog Hop!! I'm sure you've enjoyed seeing Debra's Soft and pretty designs with the On the Grow Set on her blog, Heartfelt Inkspiration. When you've seen the hop (or if you need to reorient yourself), continue on over to the Stampin' Addicts website...We're having a Stamp Jam this weekend with some fun challenges and chat, and of course you're welcome to join us for the fun. I'm showing off the Sunny Fun set! I love this set's variety! I used the flip flop stamps for a Lilly Pulitzer inspired card in pinks and greens....I would use this to invite friends for an evening of grilling out, or possibly even for a girls day out. I have a confession....I cut the floral flip flops off the rest of the stamp. I imagine using them more by themselves than with the entire stamp, and I can still use it by placing it back in its spot on the clear block and fitting the cut edges back together. The riotous color of the Beyond the Garden designer series paper has a tropical feel too I think. I love the littlest flip flops, stamped and punched with the one inch circle punch, layered onto the new 3 step doily punch! I now wish I'd used the Happy Birthday sentiment from the On Your Birthday set instead, but what's done is done. I'd used the swimming children stamp already (post below), so I didn't create another for the hop. 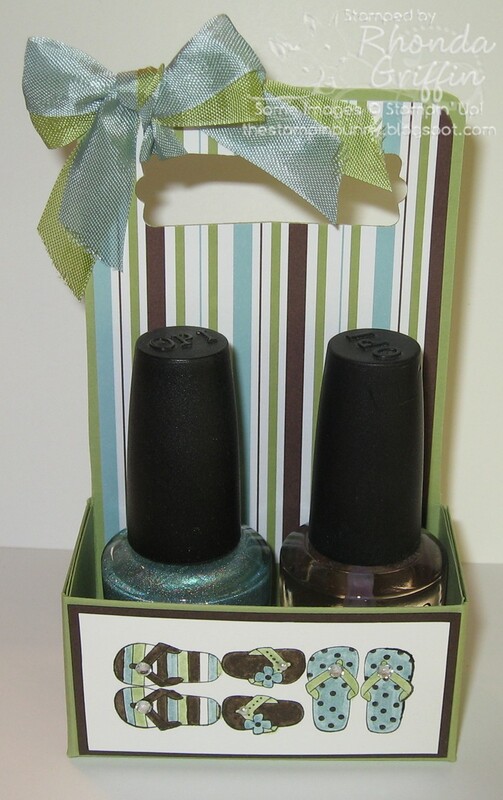 Lastly, nail polish makes a fun gift for a variety of ages, and this little box makes a sweet bit of packaging! I'll have a tutorial for you on Monday, but it is very easy. Sorry it is difficult to see the pearls and bling on the flip flops. Now just click on to see Sara's blog....Lily's Inkpad and have fun seeing her fabulous fishy creations with Summer Splash! Lovely projects. Your little nail polish container is super sweet. I like your idea of cutting off the flip flops, what a great way to easily use that portion! Great projects! I'll be coming back on monday for the polish box tutorial! Oh my goodness, those frosty sno-cones and popsicles are too cute! And how fun is that polish caddy--wonderful work, as always, Rhonda. . . .
Love the little tag on the second card -- fab idea to use that punch as a mat! Way tooo cute!!!!!! love all your projects!!! This set hasn't really tripped my trigger, but you did really cute stuff with it. LOVE the glitter on the snow cones! Cute nail polish caddy too. You made me think of summer with all the flip flops. Love this set! Great job! Your projects are adorable and look likes you had alot of fun doing them. Thanks for sharing. Great projects Rhonda!! Love them all!! Such a fun stamp set! Seeing all of your projects makes me long for summer! Thanks for terrific ideas! So very cute! Love all your ideas for this set. I swear I can smell the popsicles. Come on summer and get here! Very cute and summery! I love the details on the ice cream card. 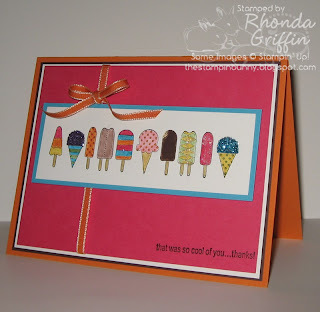 Wow your ice cream card looks delicious and I just love the flip-flops which are just too cute! Be back on Monday for the tutorial...! Tks for sharing. Oh for some summer weather to go with this! Your bright colors and sweet little details are great! I never thought of being able to cut stamps apart and put them back together on the clear block! Thanks for the tip! What a great set of colors with each project! Cute color combo on your nail polish holder. I also LOVE the ice cream card with the blue glimmery snow cone. Great idea cutting off the flip flops. I think I might do the same thing. What fun projects!!! But the last one tops them all! Great job! Such fun projects, Rhonda! Love the way you used the glitters for the ice cream and the bling for the flip flops! Fun idea for the nail polish holder. Perfect gift for the perfect pedicure! Fabulous ideas with this set...I love the little nail polish holder, can't wait for the details. Fun projects! I like the idea to cut the stamp apart--it does seem more versatile that way!